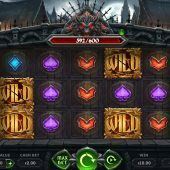 Wolf Hunters slot takes us into the dark world of horror with spooky music and a Gothic scene behind the reels, which are set over a sinister looking castle of which the gargoyle stares down at us from above the middle reel. The sense of foreboding is set and Wolf Hunters does it rather better then Netent do with their Bloodsuckers and Bloodsuckers 2 slots, or Novo's Spooky House which is far too juvenile in appearance. I doubt we'll see one again as truly scary as iSoftBet's Paranormal Activity but I can take a shock - let's just hope the bankroll doesn't have to as well. There's a lot going on here but the simple stuff first: 20 paying lines over 5 reels of 3 rows apiece and stacked icons. The 5-of-a-kind pays are Wilds or Werewolves 25x bet, Snare 12.5x, Poison Vial 8X, Silver Spike 6x with four card suits paying either 3.5, 3 or 2.5x bet for a full line. There are scatters too only appearing on the end reels but the Werewolf here has special properties along with the Wild itself. Wild Re-spins - any Wild in view triggers a re-spin and this continues after pays until no further Wilds are added. You will have noticed the male Wolf Hunter standing by reel 1 and the female Huntress by reel 5. These both have meters beneath the which stop at 100 but we'll come to that later. For now you need to know that any Werewolf landing in view will trigger an animation where a Hunter may kill it. This seldom happens but if it does, the Werewolf will also turn into a sticky Wild and count in the Wild Re-spins. If you see the Hunter and Huntress on reel 1 and 5 respectively you will get 10 free games in which they have a higher chance of slaying the Werewolf when he appears so increasing Wild opportunities. You cannot retrigger them but if you collect 3 of either of them during these spins then you will get 2 extra spins and the Werewolf Wilds will expand when they land, up and down if the 3 Huntresses are collected and to the left if 3 Hunters are accrued. You can get both 3 times but only one will fight the Werewolf on any given spin so the Wild will expand according to the Hunter randomly chosen to fight. Each time a Hunter beats the Werewolf their meter will increase by 1 and when it reaches 100 you will get 10 Hunter spins. Whichever Hunter it is triggered on, they will be 'enraged' during the 10 spins and will win every battle with the Werewolf thus all Werewolf icons will become Wilds. These are the most lucrative and hardest to trigger. There is a meter under the Werewolf Gargoyle at the top of reel 3 and you need to accumulate 600 kills to trigger them! 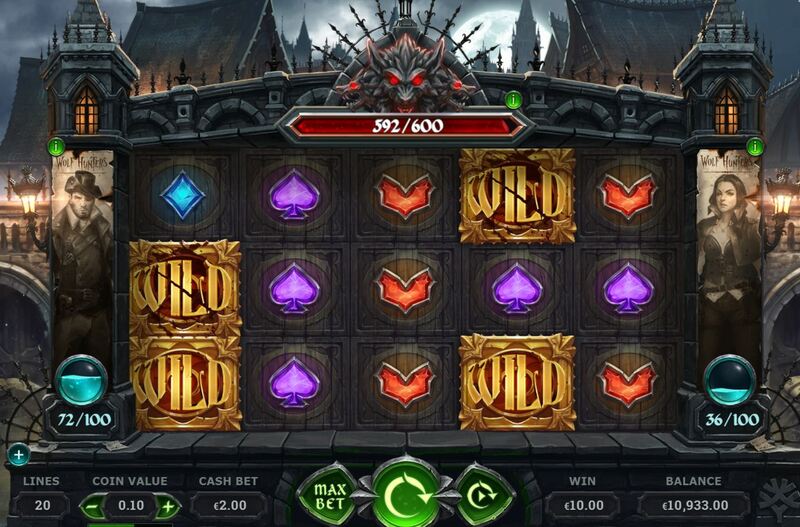 This will take you thousands of spins and like the Hunter/Huntress meters these are stored at your casino between log-ins. There are no battles here; every time the Werewolf appears it turns into an expanding Wild instead.